Rembrandt was his own favorite model, and there is no moment in the artist's biography that he did not vividly represent. Rembrandt portrays himself here in the characteristic beret that had been associated with the artistic milieu since the sixteenth century. The chain around his neck was a symbol of prestige awarded to artists, often by a noble patron. 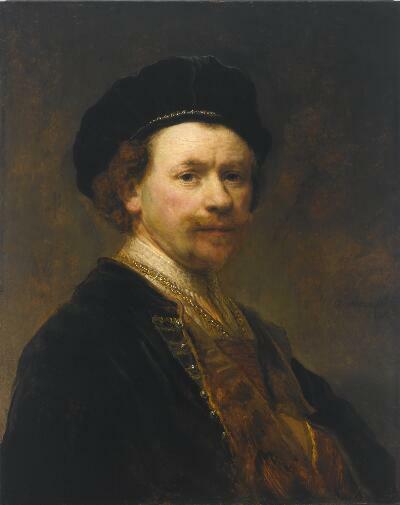 The combination of elegant attire and an artist's attributes elevates Rembrandt to the status of a fine artist. This distinction was important at a time when artists were only beginning to realize their social standing among the creative elite. At every stage of his life, from exuberant youth to destitute old age, Rembrandt looked into the mirror and painted what he saw. Here he’s in mid-thirties, well on his way to becoming the most successful portraitist in 17th-century Holland. He observes us—and himself—with confidence. His brow wrinkles slightly, suggesting thoughtfulness and intelligence. With a conscious awareness of his heritage, he’s costumed himself in the velvet beret and gold chain worn by the great court artists of the Renaissance.